Following our launch last week, Community Finance Solutions is now accepting applications for support. Based out of the MaRS Centre for Impact Investing, Community Finance Solutions provides expert advisory support to initiatives that are creating new impact investing funds and products in communities across Canada. Interested initiatives can complete a short application form here. The deadline is April 1, 2014, and applications will be considered on a rolling basis. For those who could not attend the launch, we wanted to share a summary of the webinar and some common questions, as well as our approach and objectives. 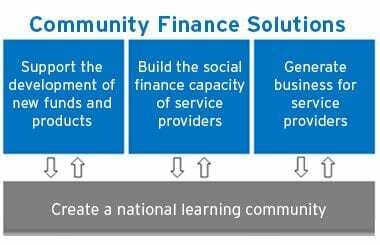 We held a national launch for Community Finance Solutions last week, via a sold-out webinar (available in its entirety here) with participants from British Columbia to Newfoundland. Others tuned in from the United States and the United Kingdom. Our featured presenters told the origin stories of two impact investing funds. Marguerite Mendell, economist and professor at McGill University, described the process of developing the Fiducie du Chantier de l’économie sociale (the Trust), a patient capital loan fund based in Montreal. Jane Bisbee told the story of Edmonton’s Social Enterprise Fund, a loan fund targeting social enterprises across Alberta. The speakers identified some common themes in the fund development process. Origins: In both Quebec and Alberta, the idea for the fund responded to an identified community need. Social workers employed by the City of Edmonton painted the original vision of the Social Enterprise Fund. A collaborative of social finance innovators and researchers in Quebec developed the Trust. Identifying investors: The City of Edmonton’s early commitment to investing and contributing to operating costs was the key to the Social Enterprise Fund’s success. Edmonton Community Foundation also showed leadership, seeking mechanisms for channeling a portion of its endowment into impact investments. In the Trust’s case, a federal subsidy and an investment from the provincial government attracted private investors, including two labour solidarity funds. Cultivating a pipeline of clients: Both funds focus on making loans and rely on others in the community to boost the investment readiness of social enterprises. Quebec enterprises benefit from a provincewide network of business development supports. In Alberta a growing number of organizations assist with business plan development. Timeline and cost: As Jane Bisbee noted, “It’s going to take longer than you think and it’s going to cost more than you think” to set up a fund. The development process for both funds included extensive community consultation and tapped into the experience of groups around the world. Beyond the insights provided by the guest speakers, webinar participants asked some questions about Community Finance Solutions. What types of initiatives do we support? Community Finance Solutions supports individuals and organizations that are working to launch new impact investing funds or innovative financial products in Canada. We work with high-potential projects that are beyond the ideation stage. You can find more details about our criteria and examples of the kinds of projects we support on our program page. Are there any costs for the program? Program costs for participants depend on the stage of the enterprise, as well as the scope and scale of work. We are able to provide a defined amount of pro bono and reduced cost support for select initiatives that are at an early stage of development. We are grateful that our partners are able to donate some of their time and expertise so that we can lower the barriers to entry for new projects. Our objective with early-stage initiatives is to help them refine their concepts and to build supports so that they can secure funds for further development. As initiatives are able to pay for services and/or the scope of work is more significant, there is a greater resource commitment required and an associated cost. Accordingly, we regularly partner with or make referrals to other service providers to ensure that we are generating business for them and building local social finance ecosystems. We connect initiatives to the specific supports they need when they need them in order to get their funds and products launched. Our approach at Community Finance Solutions builds on the lessons learned by impact investing pioneers such as the Social Enterprise Fund and the Trust. We recognize that the best initiatives respond to community needs and are community led. Our model of support is collaborative: we draw on our internal resources and networks to inject expert advisory support where it will have a catalytic impact. This includes introducing innovators to peers working elsewhere in the country or across the globe. Our overall objectives are to create new funds and financial products, to increase the social finance capacity of service providers and to build business for service providers working in the impact-investing space. 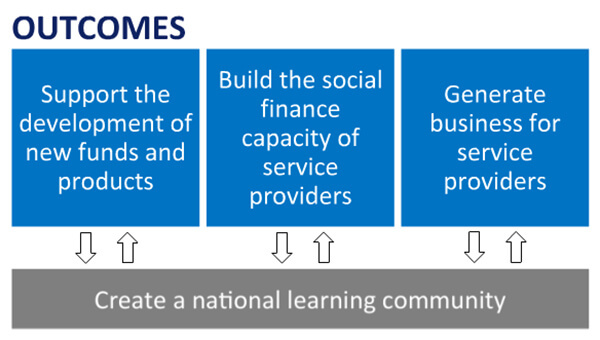 Throughout this process, we seek to build a national learning community that can share lessons and leverage successes. Thank you again to our speakers, participants and partners. Check out the full webinar for more details. Applications are due by April 1.